An often quoted figure for the ancient Library holdings at its peak is half a million documents, though whether this refers to the amount of books or the number of papyrus scrolls is unclear. However, in view of the fact that many papyrus rolls were needed to make up an entire book, it is more likely that it refers to the number of scrolls. Even 500,000 scrolls has been thought too high by some scholars, as the construction of a building with such a vast amount of storage space would be an immense, though not impossible undertaking. Nevertheless, during the reign of Ptolemy II the collection at the Royal Library became so vast that a daughter library was established. This library was situated in the precincts of the temple of Serapis, in the Egyptian district of Rhakotis, in the south eastern part of the city. During the librarianship of the Greek writer Callimachus (c 305 BC – c 240 BC), the daughter library contained 42,800 scrolls, all of which were copies of those in the main Library. The Burning of the Great Library? The infamous destruction by fire of the Library of Alexandria, with the consequent loss of the most complete collection of ancient literature ever assembled, has been a point of heated debate for centuries. What exactly happened to this amazing storehouse of ancient knowledge, and who was responsible for its burning? However, it is probable ‘the greatest catastrophe of the ancient world’, may never have taken place on the scale often supposed. The prime suspect in destruction of the Library of Alexandria is Julius Caesar. 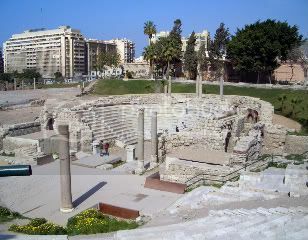 It is alleged that during Caesar’s occupation of the city of Alexandria in 48 BC, he found himself in the Royal Palace, hemmed in by the Egyptian fleet in the harbour. For his own safety he had his men set fire to the Egyptian ships, but the fire got out of control and spread to the parts of the city nearest the shore, which included warehouses, depots and some arsenals. After Caesar’s death it was generally believed that it was he who had destroyed the Library. Roman philosopher and dramatist Seneca, quoting from Livy’s History of Rome, written between 63 BC and AD14, says that 40,000 scrolls were destroyed in the fire started by Caesar. Greek historian Plutarch (died AD120) mentions that the fire destroyed ‘the great Library’ and Roman historian Dio Cassius (cAD 165 – 235) mentions a warehouse of manuscripts being destroyed during the conflagration. If the great Library was attached to the Museum then Strabo obviously felt there was no need to mention it separately, and, perhaps more importantly, if he was there in 20 BC, the Library had obviously not been burned down by Caesar twenty-eight years previously. The existence of the Library in 20 BC, though in a much less complete form, means that we have to look to someone other than Caesar as the destroyer of Alexandria’s ancient wonder. In AD 391, as part of his attempt to wipe out paganism, Emperor Theodosius I officially sanctioned the destruction of the Serapeum, or Temple of Serapis at Alexandria. The destruction of the Temple was carried out under Theophilus, Bishop of Alexandria, and afterwards a Christian church was built on the site. It has been hypothesised that the daughter library of the Museum, located close to the Temple, and the Royal Library were also razed to the ground at this time. However, whilst it is plausible that manuscripts from the Serapeum library may have been destroyed during this purge, there is no evidence that the Royal Library still existed at the end the 4th century. No ancient sources mention the destruction of any library at this time, though 18th century English historian Edward Gibbon mistakenly attributes it to bishop Theophilus. Omm Sety – Priestess of Ancient Egypt? The Phaistos Disc – Ancient Artifact or Modern Fake? Göbekli Tepe – the World’s First Temple? Powered by WordPress v 4.9.10. Page in 0.419 seconds.